"Words fail Norman Mailer yet again." How witty! And what a great way to deal with a bully. Eugene Gore Vidal was indeed a man of his own right–true to self–and irregardless of whether or not one agrees with his philosophies, he was inside, a generous, kind, and caring human being, and one to be admired in many respects. He mailed me a six page handwritten letter from Italy shortly before leaving the country for the US. It was a generous letter, and revealed his deep respect for his heritage. His compliments were free, and one comment was an opinion concering my G. Grandmother; he quoted: "The part I like best is about GALLANT EMMA (Gore)." 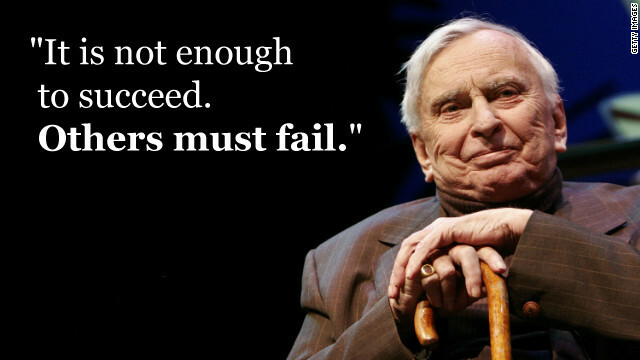 Thank you, Gore Vidal. Why even compare Vidal with Covey? Because they both died? Anyone dumb enough to buy self-help-for-executives books by Covey is too dumb to read Vidal without someone telling him what the words mean. Covey and Vidal compared? I never would have considered it, but don't disparage Covey. He helped a lot of people become better people. Though I enjoy Vidal's writings, I don't think that claim could be made w/ a straight face. Gore Vidal helped Gore Vidal. An earlier literary giant, George Bernard Shaw, warned residents of an unspoiled beach community to fend of commercial exploitation. Returning to the site decades later he surveyed the neon scene and declared "I told you what to do and you didn't do it". I want these acerbic wits' books on my shelves, but I don't want them holding court in my living room. The charms of self-involved monologists who value the turn of the phrase over historic fact and view the masses with scorn wane rapidly. Watching Vidal's mental decline after 9/11 was heartbreaking. His conspiracy theory baggage will be part of his legacy. Maybe the liberal intellectual should have left us before senescent ramblings clouded his genius.